Will Caldwell play 3-4-3 next season? At the start of the season there were rumours in the media that Wigan Athletic were looking to sign Benik Afobe on loan from Arsenal. Little did we know at the time that it would be Afobe who would put what could be the final nail in the coffin that represents Latics’ season. Afobe has scored 23 goals this season. Wigan’s leading goalscorer is James McClean with 6. Would Afobe have been able to score like that if he had joined Latics, rather than MK Dons, at the start of the season? Or has Wigan become a strikers’ graveyard, a place where past performance counts for nothing? Gary Caldwell must have found it hard in his first three matches to resist moving towards the 3-4-3 that became the hallmark of his days under Roberto Martinez. Yesterday he employed something approaching it, with the players he had at his disposal. Given Wolves’ penchant for thrusting players forward it had looked like the right decision to play with three central defenders. It seemed to be working until Afobe scored that “soft” goal, which sapped away Wigan’s brittle confidence. Caldwell would have hoped that a back line of three, becoming five with the wing backs dropping back, would cut out possibilities for a headed goal of that type. With Latics a goal down and not looking like pulling one back, Caldwell felt it necessary to move to a conventional back four, so that he could accommodate changes in midfield and up front. William Kvist was pulled off after 56 minutes, with James Perch coming out of the back three to a holding midfield position. The goal-shy MAF came on at centre forward with the enigmatic James McClean moving to the left wing. Twelve minutes later Caldwell took off Jerome Pennant for Billy Mckay. But unlike what happened in the previous match with Brighton, the changes did not work this time around. Indeed the departure of Kvist probably did not help, given his ability to drop deep to receive passes and build up from the back. Latics are surely heading for League 1. The direction had been set in January with the selling off of so much of the family silver. The departure of thirteen players would have been unimaginable at the start of a season that promised so much. Uwe Rosler had made a fatal mistake by signing nine new players over summer, despite having a squad good enough to reach the FA Cup semi final and the Championship playoffs. The result was a fractured squad where new players found it difficult to settle in and the morale of the existing players sank. But just as Rosler had erred in bringing in so many players, Malky Mackay was to do the same. He brought in eleven over a period of three months. The disruptive pattern caused by managerial changes continues to be problematic in English football. The classic case is typified by a new manager bringing in his assistants, coaches and backroom men from his previous clubs. He then wants to bring in his own players, those who are more likely to be loyal towards him than those recruited by his predecessor. The new manager will say that he wants to bring in players who can play the kind of football he believes in. The result is inevitably disruption and turnover. However, clubs are slowly adjusting to this scenario. A new model is emerging where a Director of Football has the overview at the club. The ability of a manager to bring in hordes of new coaches, backroom staff and players is diminished under this model. The Director of Football and those above him at the club will take the lead at identifying the kind of football they want at the club. The manager they appoint would need to fit into that philosophy rather than imposing his own. With the appointment of Matt Jackson as ‘Head of Football Operations’ Wigan Athletic have moved towards the alternative model. 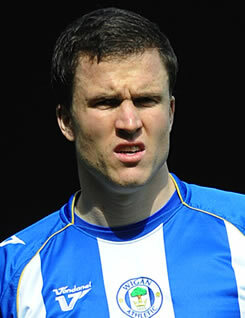 Moreover Gary Caldwell has been appointed largely because he is the right fit for the club, given the statements of young chairman, David Sharpe. Sharpe has already stated the need to bring in at least ten new players over summer. His action of creating a new department for the recruitment of players is another indication of a change in model. Moreover both Sharpe and grandfather Dave Whelan have insisted that the coaching staff largely remain intact, despite the changes in manager. When Rosler was appointed many of us expected him to bring in his assistant manager and first team coach from Brentford. In the event he was allowed to bring in Chris Haslam as Head of Performance, but the long-serving Graham Barrow was to continue as first team coach. Barrow was to be moved into the assistant manager position following the acquisition of Eric Black as first team coach in July. The rumours were that Black was Whelan’s appointment, not Rosler’s. Malky Mackay’s appointment saw the arrival of David Kerslake as first team coach, despite already having Black in place. Black remains although, in the absence of information from the club, we can assume that Kerslake departed with Mackay. The role of the coaches over the course of a terrible season has been questioned by many fans. The managers, Rosler and Mackay, have carried the can for poor performances, but Barrow, Black and goalkeeping coach Mike Pollitt remain in place. Probably the biggest failure this season was the failure of the new players signed by Rosler to reach the performance levels they showed at their previous clubs. It was compounded by the lack of motivation of players who had played under Martinez and Rosler. Seemingly bright young talents such as Adam Forshaw and James Tavernier were dispatched in January, with Emyr Huws and Aaron Taylor-Sinclair disappearing through injury. The mishandling of strikers Andy Delort and Oriol Riera was sad to see. Yesterday’s starting lineup saw just one of Rosler’s signing make the starting lineup, in William Kvist. Another two, Don Cowie and Andrew Taylor were on the bench. The events of the first half of the season clearly had a negative effect on the players released in January. Tavernier’s loan spell at Bristol City has not seen him become a regular first choice, with 8 starts and 3 appearances off the bench. Likewise Forshaw’s stay at Middlesbrough has seen him used largely as a substitute, with only 5 starts. Delort scored two goals in his first three games on returning to Tours, but has not scored in his last seven, with the club just three points above the relegation zone. Riera has been more successful having made 13 starts at Deportivo La Coruna, with four goals. Rob Kiernan too has been a success in a loan spell, having started 11 matches at Birmingham to date. One wonders if there is any possibility of those loan players returning. Delort, Kiernan and Tavernier are young and would surely improve if capably nurtured. Riera is an experienced central striker and goalscorer who was poorly treated by Rosler, then written off by Mackay. If Caldwell is to adopt a 3-4-3 system next season he could clearly do much worse than put in Delort and Riera as two of his front men. Moreover Tavernier is naturally suited to the position of wing back and will score goals if given the chance. Kiernan had a difficult time this season, but he is still only 24 years old. At his best he is a cultured central defender who can pass the ball. He can also play in central midfield. Whether the loan players will return is going to largely depend on the departure of the bigger wage earners. Latics will hope to get reasonable transfer fees for the likes of Scott Carson, James McClean and James Perch. Ali Al-Habsi will become a free agent, as will Marc-Antoine Fortune. Disaffected players like Leon Barnett and Chris McCann will most likely be encouraged to move on. The futures of the much maligned Don Cowie and Andrew Taylor might lie elsewhere. Had Afobe joined Wigan Athletic at the start of the season, could he have scored the goals to help them stay afloat? The question is academic, but given the way that strikers with good credentials have failed to make it at the club, one doubts it. The latest sad example is Billy Mckay, who must have been full of confidence after scoring a potful of goals in Scotland. Four months after signing from Inverness he still has not made a start for the club. A sad indictment on the recruiting/coaching functions at Wigan Athletic. Mckay is merely the latest in the long line of strikers who have arrived with promise, but have not been sufficiently nurtured. The coaching staff must surely take some responsibility for what has happened. Latics already have one foot in League 1. Even a draw for Rotherham in their midweek home game with Reading will be enough to finish them off. But Gary Caldwell has been like a breath of fresh air since being appointed manager. With the backing of the coaches he might well lead Latics back to the Promised Land. Wasn’t at the game, but I was told that we once again did pretty well. Gary has got us playing in a much better way. To be honest, League One is a less difficult environment in which to hone his managerial skills, and it will be easier to bring through our young players (our U18s just won the Lancashire Youth FA Cup, so big congratulations to them). I think we need to try and emulate the Southampton success story, which it looks as if we are trying to do. Southampton invested in their Academy and gave their young players a chance. They produced some extraordinary young players, which was fantastic for their own team and they generated a lot of money when they were sold. We have finally given Tim Chow a chance instead of releasing him and now we have the chance to do this next season with the likes of Lee Nicholls, Ryan Jennings and Louis Robles. The players that Saints did bring in were very shrewd acquisitions that fit in very well with their style of play. We have taken a step towards this by establishing a department for scouting and transfers. So the future looks bright if we carry on this way. I for one will certainly be following the team in to this new era.